Today we’d like to introduce you to Kerstin Phenegar Peterson. Kerstin, please share your story with us. How did you get to where you are today? In spring of last year, the company I am working for anticipated down-sizing. The owner and I were looking for other businesses to consider purchasing when I saw a record store that was listed for sale. This was something I wanted so bad, I could feel it in my soul. Although that transaction was not going to work, all of the analysis during that exercise showed that owning our own store in our hometown was a possibility. In preparation for our main goal, we started buying and evaluating sets, setting up our distributors, finding our retail space and furnishing it. Eight months later, in September of 2016, we opened 4A Song Vinyl. I have been a vinyl collector my whole life. Learning all the ropes on running a store is quite different than being a fan. Basic accounting and administration of any business is pretty much the same in any industry. Trying to anticipate customers’ tastes and constant marketing will always be a never ending task, but an enjoyable one. My biggest obstacle to date is the 4A Song Vinyl Record Store Day Pledge not being accepted. With my pledge not being accepted, there are exclusive releases that I am not able to provide to my customers. Although I certainly appreciate an organization bringing such awareness of the culture, it has been an unwanted pressure as a Record Store Owner. We pride ourselves on customer satisfaction and it was a rough ride as a new store for our first Record Store Day in April of 2017. At a time when most owners are saving their budgets for exclusive releases, I was able to take advantage of sales put on by distributors that I was able to pass along to my customers. In addition to deep discounts, we were able to provide lunch for 100 people, activities for kids, and an acoustic set by a local band that had just put out a new release. We have made attempts to request additional information and hope to have the situation resolved at some point in the future. So let’s switch gears a bit and go into the 4A Song Vinyl and Jukeboxes story. Tell us more about the business. 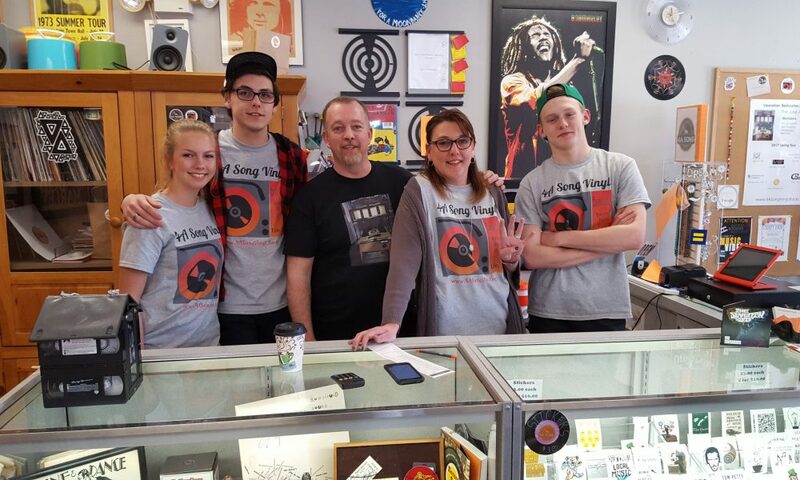 4A Song Vinyl and Jukeboxes is a family run local business in Downtown Lisle IL. We sell new and vintage vinyl along with some music lover expressions and collector needs. Our In-Store Events are always a great time and include activities that are categorized as “The Pinteresting Experience” (projects where we repurpose damaged, unplayable vinyl). The portion of our business that separates us from all others is our Jukeboxes. When we opened we had 6 in inventory and are now currently on a wait list for when a new one hits the sales floor. Earlier this year, we picked up a broken jukebox from 1955 and began hosting “The Juke Journey”, a meeting every other week where interested individuals would discuss restoration efforts. “Rita” was completed in six weeks and was then sent out on “tour” to six local businesses for a week at a time. The Jukebox club now meets every Thursday (sometimes Tuesdays and Fridays too!) and work on a variety of projects. In addition, word has started to spread, and we are currently under contract to restore a 1936 Wurlitzer. Initially when I looked at the questions to prepare for, this section asks who else deserves credit – have you had mentors, supporters, cheerleaders, advocates, clients or teammates that have played a big role in your success or the success of the business? If so – who are they and what role did they plan / how did they help. Thankfully, my Mother’s entrepreneurial spirit has been passed down the line, along with her accounting mind frame. It is these 2 essential pieces that have given me the tools to keep me going on this project. I knew at age 19, wanting to own my own record store was in my soul. It incorporates all of my work related passions; accounting, inventory, event planning and Bonus… MUSIC! Of course, I could not make all of this happen by myself. My husband did! He has the patience and understanding that is necessary when starting a new business. On top of that, thankfully, he knows how to fix anything! Throughout our entire 12 year relationship, anything that we tackle together becomes a success. He is my perfect partner and I could not maintain without him. Our kids help out in several ways. Tim, Zach and Brianne have taken shifts at the shop, extra duties at home, helped me with social media and telling everyone they know about our shop. My niece Brianne has gone above and beyond and I would really struggle without her constant help. I highly recommend taking a trip to 4A Song Vinyl.. The staff their are extremely, friendly,knowledgeable, passionate about their business and willing to help you locate the item you are looking for. Its a fun place to hunt for records and check out those vintage jukeboxes that will make you wanting to come back for more. Thanks for the note Michael! My apologies for the late reply, sad to say I am just reading this now. I truly appreciate you taking the time to leave a comment!